Winter isn’t over yet!! If you live in an area that experiences bad winters, you want a vehicle that can get you out of bad situations. Getting stuck in the snow and sliding on ice can be a stressful situation, and a dangerous one. The 2019 Jeep Grand Cherokee is designed with problems like these in mind. It’s capable, powerful, and can keep out of these situations. 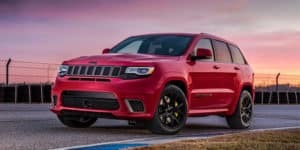 Here are some of the top reasons the 2019 Grand Cherokee is one of Eastgate Chrysler Dodge Jeep Ram‘s top picks for getting to your winter destinations safely and comfortably. The 2019 Jeep Cherokee has an available Selec-Terrain Traction Management System that’s a game-changer when you’re driving in inclement weather. Switch to the snow traction mode to take on any winter road ahead. The system balances how the 4×4’s power is split between the front and rear wheels to give your vehicle the best traction possible for the situation. Safety isn’t the only thing, even if it’s the most important. You want to be comfortable on your winter trips too. With the 2019 Grand Cherokee, you have the option to upgrade to heated front and rear seats—perfect after a long day on the slopes or just to get warm after a gas station stop. Add the heated steering wheel and you’ll be good to hit the road. If your winter trips tend toward the choose-your-own-adventure style, take a look at the 2019 Grand Cherokee Trailhawk trim level. With superior ground clearance, traction, and articulation, you can navigate the toughest winter conditions while you’re off-roading. Equipped with tow hooks, skid plates, and a top-rated 4×4 system, the Trailhawk lets you make your own paths. The most unsafe aspect of the 2019 Grand Cherokee is that it has to share the roads with other drivers. Luckily, the crossover comes with safety technologies that let you keep an eye on what other people are doing. With standard features such as blind spot monitoring and rear cross path detection, you can be aware of what’s happening around your vehicle more than ever. Upgrade to the advanced safety package to get even more cool and safe features, such as adaptive cruise control, lane departure warning with lane keep assist, park assist, and more. When you’re taking a winter trip, you’re more than likely packing a little heavier than you do for summer trips. The Grand Cherokee comes standard with a 60/40 split folding back row to let you get your gear in easily. Have more passengers than cargo? The Grand Cherokee seats five with the seats up and still has a great amount of cargo space behind the back row. When you’re ready to get behind of the wheel of a 2019 Jeep Grand Cherokee, give us a visit at Eastgate Chrysler Dodge Jeep. We’ll get you going for a test drive so you can see what it’s like to drive one of the most reliable vehicles on the market right now.